Can you believe your eyes? How often do you run across one of these? Not too many survived the original Woodstock. Mellow out in this and you may find yourself craving a hand-rolled cigarette and some Crosby, Stills and Nash playing in the background. Don't be surprised if you develop the urge to protest something. 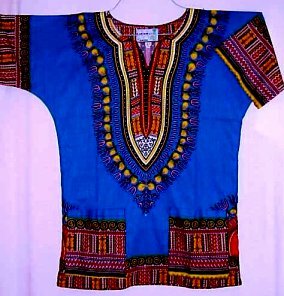 These reproduction dashikis have never been worn and are made out of 100% cotton.